PREMISES JAZZ PIANO SUMMER SCHOOL is an intensive five-day immersion from 17th to 21st August at the Premises in Hackney. At the end of the course, all students get to make a recording with bass and drums in the Premises solar–powered recording studio. 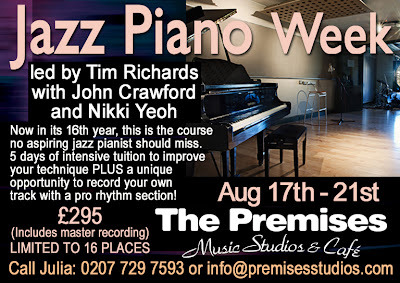 London is jazz piano town, and the tutors, Tim Richards, NikkiYeoh and John Crawford, are all among the busiest and most-respected we have. Tim has a whole suite of piano tutor books published by Schott. His Exploring Jazz Piano and Improvising Blues Piano have both won awards. There is also Exploring Latin Piano. Full details and links to Application Forms here.